Im not too sure about what is going on with mommy. Last week she actually put wheels on her PAWS! I didnt get to see it myself, but the evidence showed up on the flashy. And whatever happened after that, made her come home with all happy excitement. She said all the hoomans put wheels on their paws and then drive around in circles over and over. Sometimes they back up too. I dont get it. It doesnt look like they have anything to sniff. But she did smell pretty odd when she came home. 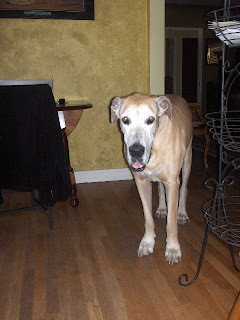 Daddy said he was smart and didnt put wheels on his paws. He only likes wheels under his tail. After the wheel incident, mommy said I need to get some vitamins in me, so she can wheel with me too. 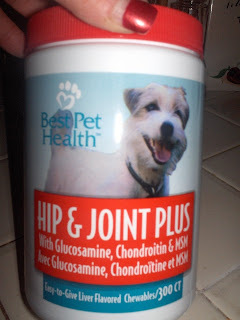 Gramma suggested this to mommy, so she said she will try it for 4 weeks to see if turns me into SUPER RUNNING DOG! So now, mommy wants to be on wheels all the time! 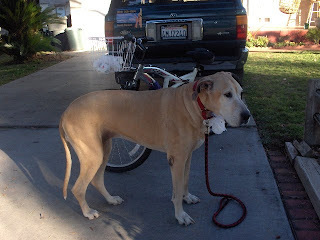 She pulled the white 2 wheeled monster out of the lair and I get to go for runnies with her. Oh, I miss this so much. We havent run since before Max got cans her. Mommy even let go of the rope and let me run free next to her. I showed her what a good doggie I was, and stayed right next to her... well, a few sniffies got in the way, but I was close to her still. I was pretty tuckered when we got home. 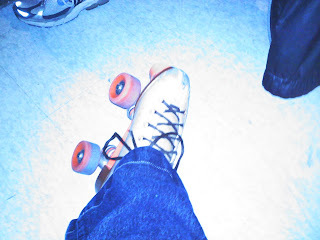 I havent excersized like this for a long time. Mommy said we will only go a little bit at a time. Well, mommy said I now have to go do my meditations before I can have breakfast. So BARK for now! So, tell mom to put those wheels on her paws and let you take her running on a leash. No brakes! Woo! Sasha, that sounds like FUN! My mom has mentioned taking me running or biking, but since I'm still growing I'm not allowed. sumthing about my growth plates needing to close. Whatever! Your mom is a closet wheelie! Cool. That walkie looked so exhausting. Wow, Sasha - you are fit for an old gal!! I don't think I could have kept that pace up! :-) Your human is really cool doing stuff with wheelies - my human is a coward and scared of doing stuff like that because she is scared of falling down! 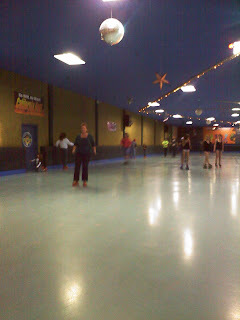 Ooooh, roller skating is fun! Looks like you both had a good time. We went back to read about Max. Very sad.